For a recap of last week's box office totals, read our box office wrap-up from Minions' opening weekend - and scroll to the bottom of this post to see how our previous picks measured up. Full disclosure: Box office predictions are not an exact science. We acknowledge our picks may not always be correct. For the sake of offering a jumping off point for discussion, here are our picks for the weekend of July 17 - 19, 2015. This weekend, Ant-Man opens in 3,700 theaters and Trainwreck debuts in 3,100 locations. In limited release, Irrational Man, The Look of Silence, Mr. Holmes, and The Stanford Prison Experiment all open on an unspecified number of screens. Our pick for the top spot this week is Ant-Man, the latest release from Marvel Studios. Though the movie isn't arriving with as much hype as some of the studio's recent works (like Avengers: Age of Ultron), the safe money is always going to be on the Marvel machine. After all, Guardians of the Galaxy was once thought to be a massive risk and ended up being one of the biggest films of last year. 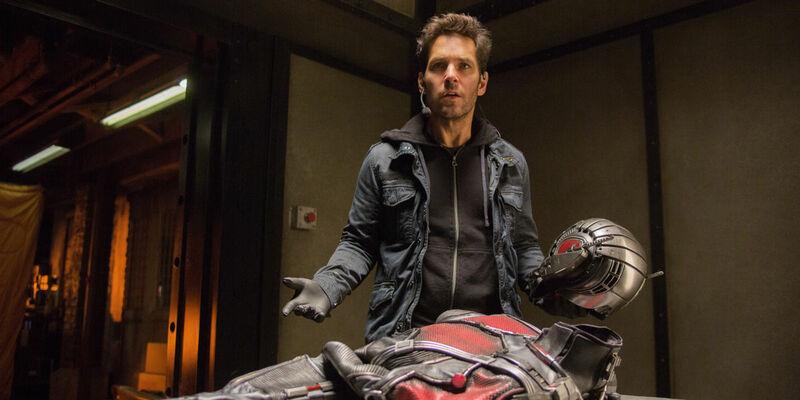 It's true that Ant-Man is not expected to break any records, but its projected $66 million opening is more than respectable, and with the film generating positive early reviews, the masses should be interested. Ant-Man is also getting a boost from its marketing campaign, which is painting it as a film the whole family can enjoy. The trailers and TV spots have made good use of the film's combination of humor and action, selling audiences on a rousing crowd-pleasing piece of genuine entertainment. It's actually been a while since a live-action blockbuster hit it big, and with Jurassic World finally starting to slow down, everyone will be looking at Marvel to deliver the next batch of thrills. Look for last week's champ, Minions (read our review), to fall to second in its second weekend. Universal's animation spinoff had a phenomenal debut with $115.7 million amassed in its first three days. The film is yet another smash hit for the studio, but unlike Jurassic World, this one probably won't stay on top for multiple weekends. Ant-Man, carrying the Marvel banner, is going to generate business, and films that open big typically see a significant decrease after their first weekend. If Minions had made more money, then its chances of a repeat would be pretty good, but it will most likely have to settle for second place. Coming in third should be Trainwreck, a new romantic comedy starring Amy Schumer and Bill Hader. The film is getting a big boost in profile thanks to the rising popularity of Schumer, who has recently emerged as one of the industry's top comedians. With this being her first major movie project, there are going to be plenty of eyes on it to see how she succeeds in this realm. Trainwreck is also getting a nice assist from critics, with early reviews praising the writing and relatable nature of the characters. Since it's coming out in the middle of the summer, that positive buzz should definitely help. In addition, Trainwreck should be a great option for couples on date night, making it an appealing counter-programming option. Though Schumer is the star, there's plenty here for the guys to enjoy too. NBA star LeBron James was featured heavily in the marketing (particularly during the NBA Finals), so the chance to see him as a comedy scene stealer could prove to be too good to pass up. With an opening weekend estimated at $30 million, the "smaller" Trainwreck should have a great weekend, even if it can't keep up with the larger competition. Our pick for fourth is Jurassic World (read our review), which came in second last week with $18.1 million. The dinosaur extravaganza is coming off the crazy high it was on for the past month, but it's still chugging along and should stay in the top five for at least another week. Rounding out the top five should be Inside Out (read our review). Pixar's latest finished in third last week after making $17.6 million. Like Jurassic World, its business is slowing down after breaking some records, but the appeal of the movie is still strong and it'll make at least a little bit of money. We correctly predicted all five spots. Next Week: Pixels, Ant-Man, and more!